Professor John Simes was awarded the John Zalcberg OAM Award for Excellence in AGITG Research at the AGITG 2018 Annual Scientific Meeting for his commitment to groundbreaking research in gastro-intestinal cancer. Professor Simes has had an exemplary career. He was a key member of the team of investigators that developed the first clinical trial conducted in Australia for gastro-intestinal cancer patients. Over his career, he has enabled over 80,000 people to access new and emerging treatments. 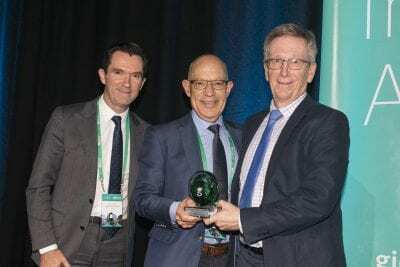 “I am honoured to be a recipient of this award and grateful to have been recognised by my colleagues for my contribution to improving treatments for patients,” says Professor Simes. “It is a great privilege to receive this award and to be part of the achievements of AGITG which are making a real difference for those affected by GI cancer”. He founded and is currently the Director of the National Health and Medical Research Centre’s Clinical Trials Centre at the University of Sydney and the Director of Sydney Catalyst Translational Research Centre. He is a Professor of Clinical Epidemiology in the faculty of Medicine at the University of Sydney. In a career spanning four decades, Professor Simes has been a tireless advocate of the value of clinical trials. He was a founding member of the AGITG when it formed in 1991 as a network of investigators. He was a founding Board Director when it became a company limited in 2000, and was the longest serving member on the Board of Directors when he retired in May 2018. He has been a key member of the AGITG’s Scientific Advisory Committee since 1991. He has been a member of the Trial Management Committees for seven AGITG trials, including the practice-changing CO.17 trial in colorectal cancer. He has been a key leader of the AGITG for over 27 years and has made an incredible contribution to the AGITG’s success.